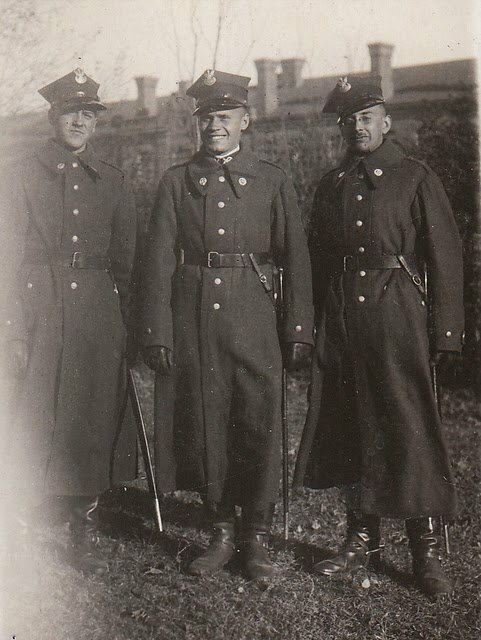 My grandfather Antoni Zbigniew Soltys-Kulinicz, middle, was an officer in the Polish army during World War II. He was imprisoned in a POW camps, and at the end of the war took the first deposition of the Katyń massacre, and thus helped to shed light on this Soviet atrocity against poles. He found himself in London after the war, but decided to return to his home country, now under Soviet occupation, and he lived there knowing that his connection to Katyń (a massacre that was hypocritically denied by the Soviets and the puppet regime in Poland) could cost him his freedom or his life. Especially, as he was mentioned in history books for his role in translating into English the depositions given to him by witnesses. I plan to write a longer post about this fascinating history, but for now I will note that sadly history repeats itself, as new evidence is coming to light that the crash of the Polish airplane (April 10, 2010), carrying the entire head of the Polish government to Smolensk to commemorate the 50th anniversary of Katyń, took place with Russian involvement. Among the dead were President Lech Kaczyński and his wife, much of the president’s staff, 18 parliamentarians, 10 generals and admirals representing Poland’s top military leadership, and many other political notables. The disaster decapitated Warsaw. Read more here. I just read your article about your grandfather and the crash in Smolensk with the president of Poland. I remember the crash well. In fact, I text or emailed your father about the crash. Being a pilot and former military I always have an interest in activities surrounding those issues. My question was and still is why would the president of Poland be flying in a Russian TU 154. They do not have the best reputation for being a quality aircraft. We may never know the answer to this question. Your father did say at the time of the accident that the Russians were involved. It sounds more likely than not. I’m enlightened to learn of your Grandfather’s prior military service. He was a translater into English. Very impressive for being in the 40’s. Did you know your grandfather? I will keep looking for the post about your grandfather when you write it.